Prof. Alister Scott has been awarded a prestigious Knowledge Exchange Fellowship by the Natural Environment Research Council to undertake research to change the way that green infrastructure is viewed, valued, used and delivered in city planning. Green infrastructure describes a critical network of green spaces and other environmental features vital to the sustainability and economic development of any urban area. It includes not only community parks and gardens, but also informal recreation spaces, green roofs, city farms, river and canal banks, domestic gardens and allotments. It brings multiple societal and environmental benefits; from encouraging people to spend recreation time outdoors, improving health and mental well-being, improving air quality, biodiversity and reducing flood risks. However, the planning system places significant emphasis on the financial benefits that developments and land use will provide, which is much more difficult to quantify with green infrastructure. Prof. Scott will work with academics, key policy and decision makers to share and translate existing research to help both them and wider publics appreciate how to use the latest science and evidence about the role of green infrastructure to improve planning outcomes. 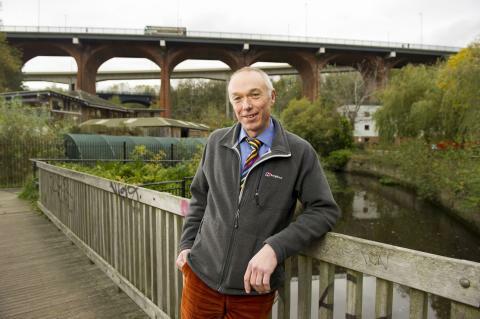 The Professor of Environmental Geography in Northumbria’s Department of Geography and Environmental Sciences, believes that if he can find ways to use green infrastructure research to help shape new investment decisions, as well as retrofit it within existing city fabric, then significant progress can be made in tackling the key challenges of air pollution, flooding and obesity. These three challenges cost the UK economy significant sums of money but also result in premature deaths. Prof. Scott explained: “Urban planning is dominated by grey infrastructure, in terms of building and delivering houses, industry, roads and transport, but these represent fragmented pieces of the complex jigsaw that make up successful places. He added: “The green infrastructure network of our towns and cities is increasingly under threat, with local authority cuts putting pressure on the investment and continued management of our parks and green spaces. “Often, these highly valued community and environmental resources are seen as financial burdens instead of assets, but this critical infrastructure helps urban places and their inhabitants thrive through the multiple benefits they deliver. These benefits include health, air quality, biodiversity, quality of life, climate change mitigation, flood and drought protection. However, because of their very nature, these benefits are difficult to quantify and generate real revenue streams and thus be incorporated into decision-making processes. While there has already been a significant amount of research into the benefits of green infrastructure, Prof. Scott’s work will assess how best to connect the various findings with policy makers and planners at the start of the process, and how to link complementary areas of research together. Northumbria University’s Department of Geography and Environmental Sciences is rated within the top 30 in the UK for research power, with over half of the research outputs being rated as world-leading or internationally excellent in the last Research Excellence Framework exercise. The Natural Environment Research Council (NERC) is the leading funder of independent research, training and innovation in environmental science in the UK. NERC invests public money in world-leading science, designed to help us sustain and benefit from our natural resources; predict and respond to natural hazards; and understand environmental change.